Plus 10 songs from the "Imagine" album that were part of "Imagine The Film", a film from 1972 where each song have their own video. The original televised version was trimmed down when released on video cassette in the eighties. 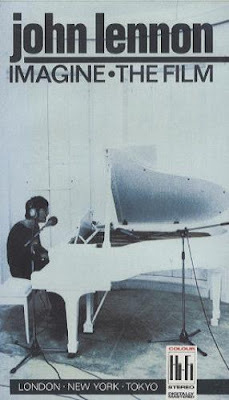 And he also filmed two more videos that were never completed during his life, "I’m Losing You" (original Double Fantasy version) and "(Just Like) Starting Over". This is a chronological list of all known OFFICIAL John Lennon music videos, a total of 76 which includes variations and new versions. Any comments on mistakes/contributions/etc are welcome. The first official Lennon video, edited together from a lot of "Bed In" footage recorded in Montreal, Canada May 1969 and other footage from Bahamas for example, available from the original unedited 16mm film, 6 minute and 20 second version. Featuring John giving some instructions at the beginning and also at the end there is more chat after he says "let’s rest". The second edit is a 5 minute version, no additional intro chat, starts directly with the count-in and ends when John says "let’s rest". There are different "bed-in" scenes inserted that are not present in version #1. This is the same as version #2 but ends earlier, comes from the "John Lennon Video Collection" and features an additional intro teaser with the title of the song, also ends after John says "OK, Beautiful yeah". From "Lennon Legend", this film features footage from war and political conflicts along with the same "Bed-in" Footage from past versions. 5 min and 10 second version, with all the dialogue at the end after the song is finished, but starts directly with the count-in. This version from "Power To The People" starts with "two" on the count-in (the other 4 versions have the full "one, two" count- in) and is the same as Version #4 except for the very end, which has different footage, also only last 4 minute 57 seconds. Doesn’t have any additional dialogue at the end. 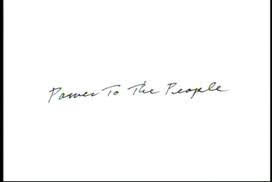 "Power to the People - The Hits" CD + DVD is the current video compilation. Directed by Jonas Mekas using different footage from the "Bed-In" in Montreal and the Toronto concert 1969, plus some external footage to create an "experimental film", broadcast on BBC Nov 6, 1969 on Top of The Pops. 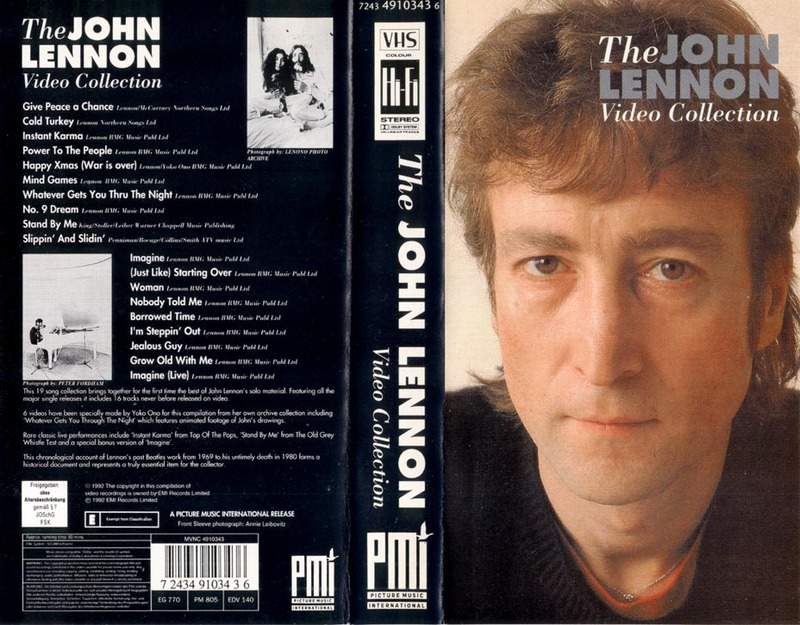 This is the same as version #1, comes from the "John Lennon Video Collection" and features an additional intro teaser with the title of the song. A new video was created for "Lennon Legend" using footage from the "One to One Concert" and Lennon and Ono leaving the Marylebone Magistrates’ Court in London, 1968. 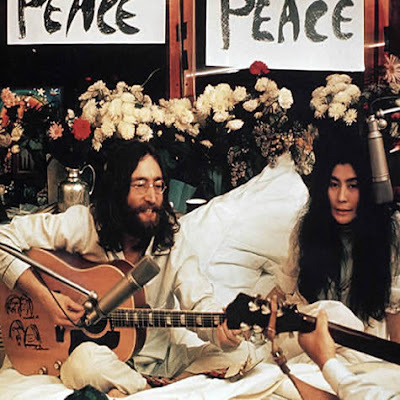 Two different Bag Productions videos using archival footage from John and Yoko from 68-70. 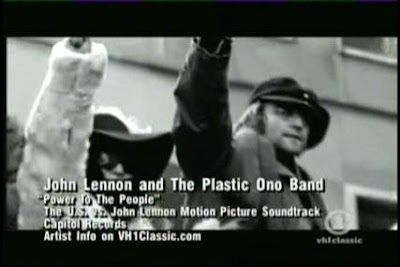 Version #1 was broadcast on Top of the Pops , February 5, 1970 and is in black and white, it features Lennon’s red clown’s nose while recording at EMI Studios on December 4, 1969, while Version #2 all in color, features a mix of archival footage along with a car ride video with a sunset effect; no available info whether this version was broadcast at that time. 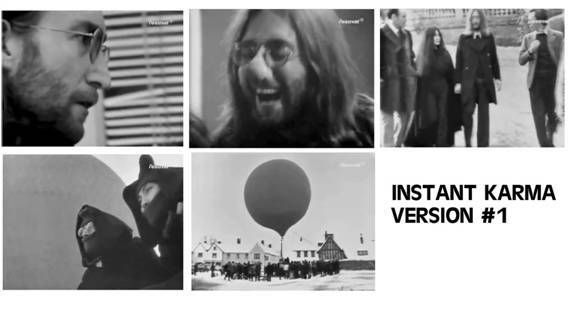 Both versions end with the Lavenham, England hot-air balloon ride shoot December 5, 1969. 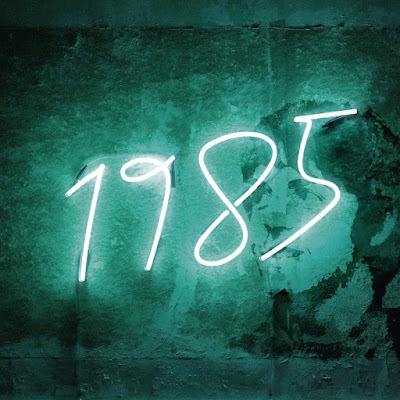 (later released using different footage as the 18 minute short experimental film "Apotheosis"). While these two different versions were originally taped for the TV show "Top of the Pops" on February 11, 1970 (first version (John with blue denim jacket) broadcast Feb 12, 1970 and second version (John wearing black turtleneck) on Feb 19, 1970), were used as promo videos years later. Version #3 appears on the "John Lennon Video Collection" from 1992, using the original broadcast with live vocal audio over the studio track, while Version #4 was released on "Lennon Legend" in 2003, but changing the original audio track with live vocal and replacing it with the clean studio version (the original live vocal of this version is also in circulation). This rare video was available only as part of the "John Lennon Anthology" EPK (Electronic press kit, only released to the media), features also the Anthology version with the "Well, Well, Well" coda. 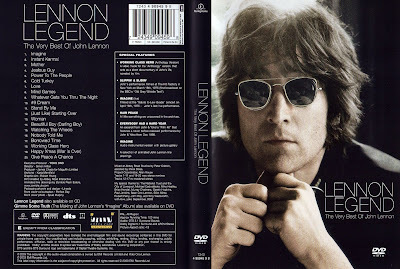 The video (like most of the Lennon videos) is a combination of well known footage from various periods of his solo years. 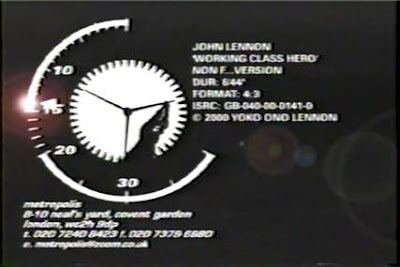 A 6:44 minute "video history" of John made for the 20th anniversary of this death using as musical bed the same version of "Working Class Hero" from the Lennon Anthology from 1998 but removing the "Well, Well, Well" coda and adding some comments by John himself, interview clips, pictures and archival footage from all periods of his life, as a Beatle and solo. Version #2 is the well known one, having the “f” word, while Version #3, is the “non f word” one, the rarest, only removing the audio part while John says this word. A completely different and new conceptual video was released for "Lennon Legend", having a child portraying a young Lennon. A video created for "Lennon Legend" using archival footage. Another conceptual video created for "Lennon Legend" using pictures of a young John, and also Fred and Julia, etc. 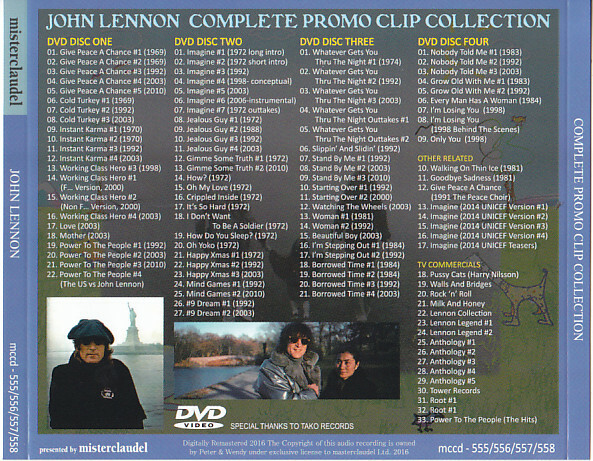 The "Lennon Legend" DVD featured a lot of newly created videos. While all three could look the very same, they are different versions. From start to the 3 minute mark, version 1 and 2 are the same, but after that, different footage appear, plus version 2 is the full length rendition without any fade out. 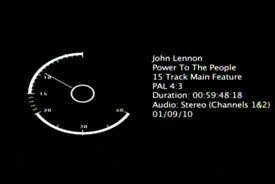 Version 3, compared with version 1 and 2, has a strong red color on the "Power to The People" sign that appears several times, and strong white color on the same sign that appear just once, plus, from start to the 2 minute and 17 second mark, version 1 and 3 are the same, but after that, Version 3 is completely different until the end, featuring more footage from the August 11 , 1971 protest in London, not available on any other version. 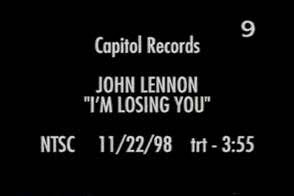 A 2 minute video created by Capitol in 2006 as part of the soundtrack of "The U.S. vs John Lennon" documentary, completely different from any of the other three versions. 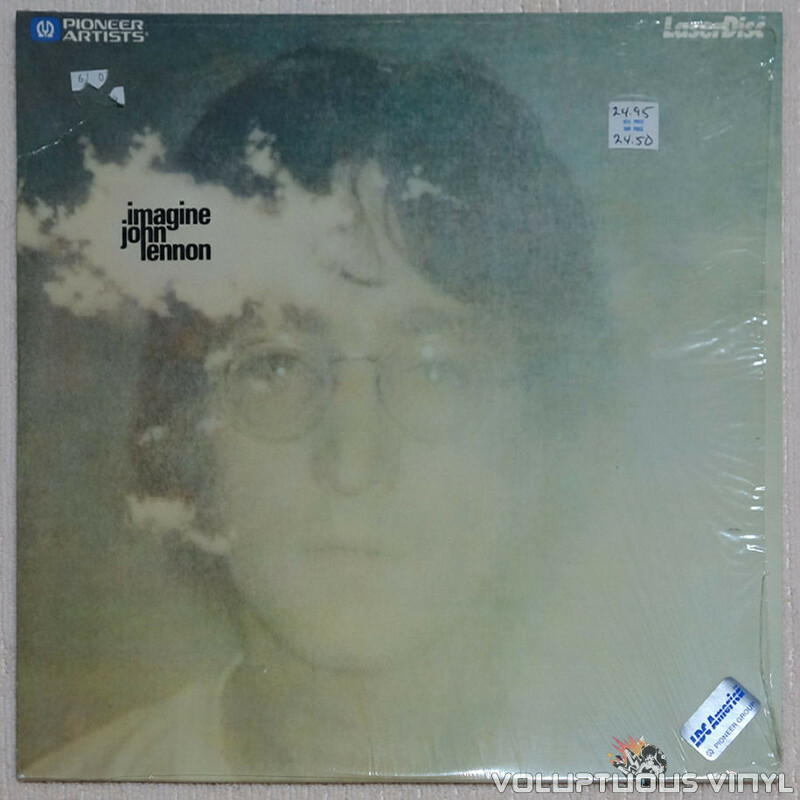 Version 1 runs 4 min and 5 seconds, has the long intro sequence in the woods, while version 2 is 3 minute and 27 second long, and also features the title “Imagine” right before the song starts. 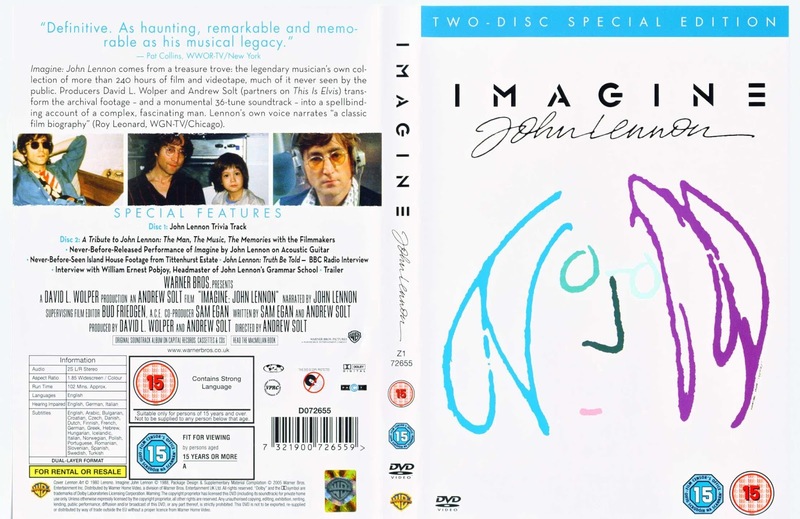 Both versions comes from the "Imagine The Film" documentary. 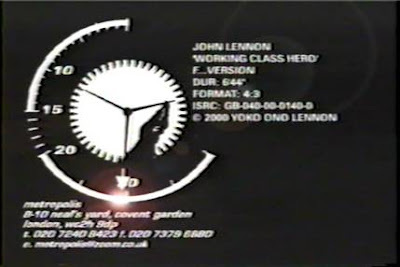 This is almost the same as version 1 and 2, except it has the introduction teaser clip that all videos from the 1992 "Video Collection" have, and starts directly with the piano notes and the end is complete, showing John and Yoko kissing each other and a picture of the ‘Double Fantasy’ cover shot. 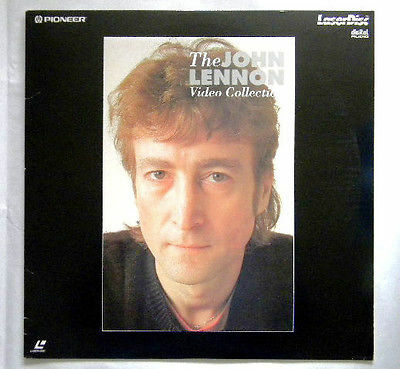 Laserdisc edition of The John Lennon Video Collection. A very rare and obscure video created to promote the “Imagine The Film” soundtrack, hardly seen after that. The video represents the cycle of life of a boy growing up, finding the right girl, problems of life, having children, getting older, all simply by crossing a door over and over and over. At the end, a grand white piano appears. A 3 minute 55 second video, almost the same as Version 1 but the intro is a few seconds shorter, and the kiss at the end is complete and with a white fade-out effect. A collection of pictures over the instrumental track. Also in circulation among video collectors, is a 3 minute clip of outtakes from the “woods” intro sequence, although never released as an official video. 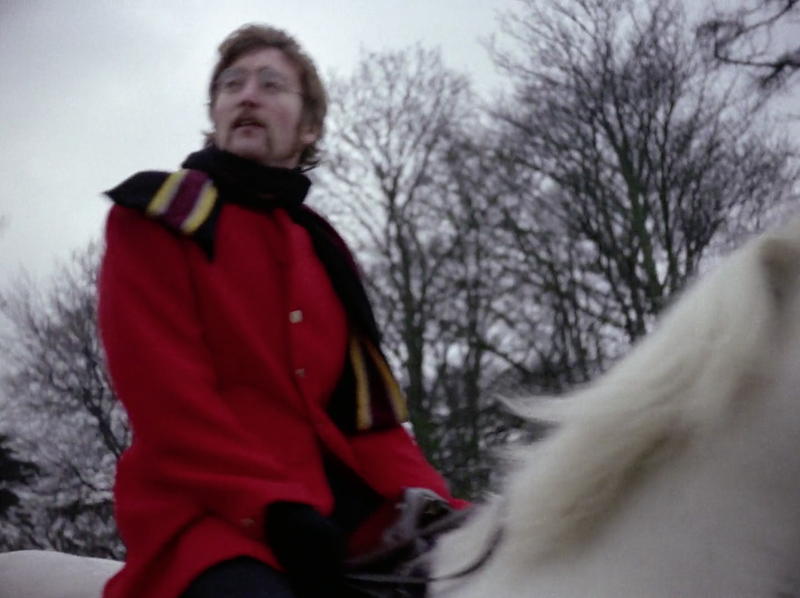 From "Imagine The Film" with footage shot at Tittenhurst Park, Ascot. 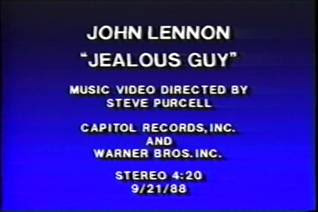 From the soundtrack of "Imagine John Lennon", directed by Steve Purcell, using a collage of pictures and old Beatle videos, and footage from the recording session. 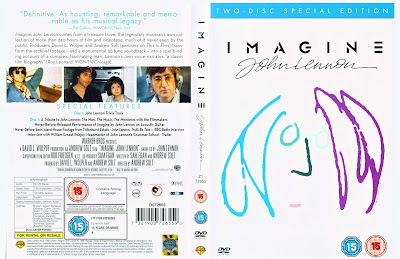 "Imagine John Lennon" documentary film. Same as Version 2, adding the introduction teaser from the "Video Collection". At some point, starts the same as version 1 just for a few seconds, after that, a completely different and new video created for ‘Legend’, using outtake footage from the 1972 Tittenhurst Park video shooting, plus footage from the recording session. Both are the same, but the 2010 version has the video in top quality. Version 1 was part of "Imagine The Film" but also as an individual promo with his own slate. 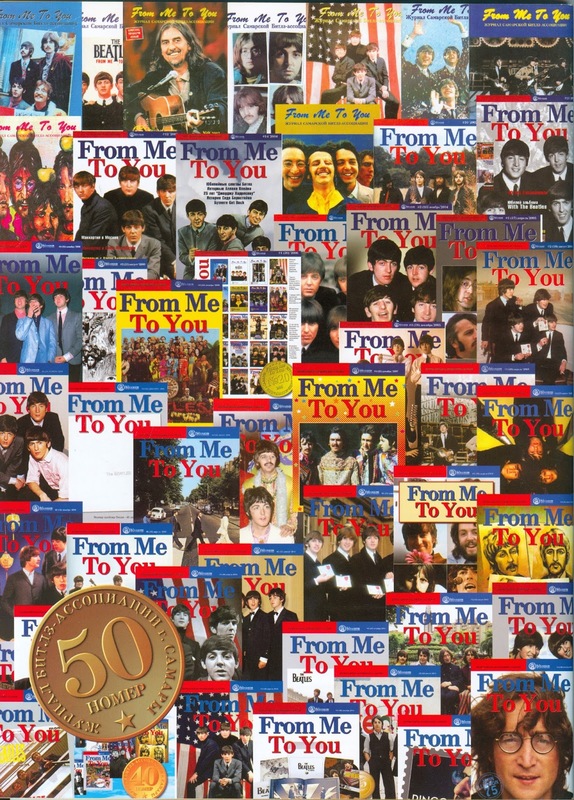 The laserdisc edition had artwork based on the album cover. All the videos comes from the "Imagine The Film" documentary from 1972 but also available as individual promo films with their own slates, at least "How? ", "Oh My Love" and "Crippled Inside". Rare version 1 was produced by the BBC, first broadcast on December 14, 1972, and features footage from a church, along with still pictures of the Lennons recording with the Harlem choir. Available among video collectors from a BBC re-broadcast, this version is not present on any of the official video collections to date. 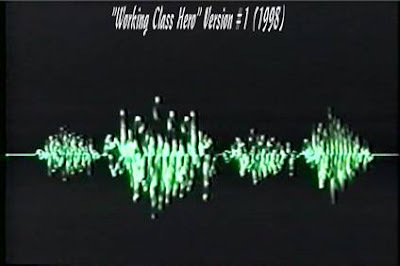 This second version was directed by Gerard Meola and features video footage of the 1992 incarnation of the Harlem choir along with still pictures of John and Yoko. The final version is a very cruel video showing moving images and footage of war consequences, suffering around the world. Version 1 shows footage from the hot-air balloon ride December 5, 1969, along with outtake footage from the "Whatever Gets You Thru The Night" video shoot on October 17, 1974, plus some other stuff. 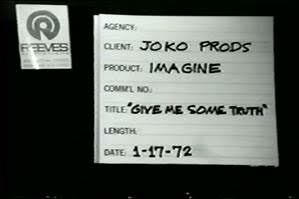 While version 2 uses only more outtake footage from the Oct 17, 1974 video shoot, bought by Yoko Ono in 2003. 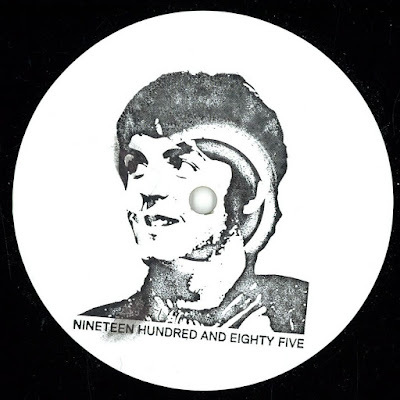 Version 1 is simply a collage of well know videos from 1969/1972, and Version 2, another collage of videos, using as base, the experimental film "Smile" from 1968, with John’s face in slow motion. The original 1:52 video for this song was filmed on October 17, 1974. Director Peter Cooper and a film crew followed John as he travelled around the city. More of this footage appears in the "Mind Games" video from 1992. In 2003, Yoko Ono bought all the outtake silent 16mm footage (over 40 minutes) at a Christie’s Auction and later used some fragments for the 2010 video of "Mind Games". From the Christie's Auction description of the film footage: This footage (...) truly captures "a day in the life" of a post-Beatle John. 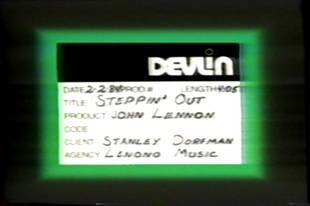 One stipulation Lennon had was that he would "direct" the film and be able to edit and keep portions of it for his own use, which he later did. The footage (...) is briefly described in the following ten "scenes:"
Some of the footage was to be used for the European promotion of the single, but may never have been broadcast. A two minutes edit was used for "#9 Dream" in February 1975 (BBC1 Top Of The Tops, not listed as a separate promo video here). 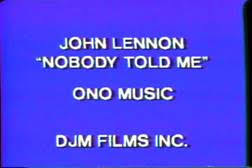 This footage was later used in 1992 in "The John Lennon Video Collection" for the video assembled for "Mind Games". A different edit saw the light in 2003 in the "Lennon Legend" video compilation. More outtake footage is available among collectors, and a 6:05 edit of this footage is available on YouTube here. Cartoon- animated video using John’s drawings. Versions 2 and 3 could look the very same but they are not. Without counting the extra 11 second teaser intro for the 1992 video, Version 2 is 3 minute and 24 seconds long, while version 3 is 3 minute and 35 seconds long, so Version 3 is 11 seconds longer. Both are the same until 2:43, where there is extra cartoon animated video on Version 3 that is not on the other, plus the audio track used for the 2003 version is the full-length take with no fade out. Originally taped for the "Old Grey Whistle Test" TV show, on April 8, 1975, these two "live in the studio" clips were used as music videos in 1992, respecting the live renditions. Newly created videos using the "Old Grey Whistle Test" footage but also adding other well known footage from many Lennon eras. Plus, using the studio audio track from the record. Version 2 is 4 min and 3 seconds long because it uses the full-length take, while Version 3 is the common version that last 3 minutes and 28 seconds. Both videos are the same from start to the 3:10 mark, after that, Version 2 has new footage not available on the other. The original video shoot for this song was filmed November 26, 1980 in Central Park and the Superone Westwater Gallery, in New York, but the video was never finished because of his death. Later this footage was used on the 1981 video for "Woman", and in 1992, reused for the new "(Just Like) Starting Over" video. 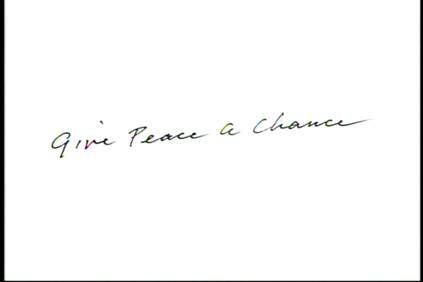 To commemorate 20 years of his death, this video was released December 8, 2000 (later used also in "Lennon Legend" from 2003). A very good conceptual video in the style of "Free as a Bird", using tons of references to his life and musical career. 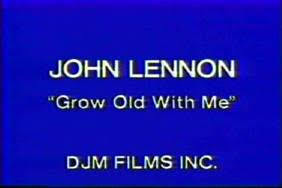 A video for "Lennon Legend", created using home movie footage of the Lennons at home and on vacation. Directed by Yoko Ono, adding some additional footage of her from 1981. Both versions are the same, except that #2 has the additional teaser intro. This video is also on the "Lennon Legend" compilation from 2003. Another "Lennon Legend" video using home movie footage, this time from a vacation in Cold Spring Harbor, New York, April 13, 1980. Version 1 and 2 could also look the same from start to 3:20, but from 3:21 to the end, both versions have different footage. A newly created video for "Lennon Legend", using footage from Ascot, England and very rare footage from Riverdale, NJ , both from 1971. Produced by Stanley Dorfman, both versions are the same, except for the 1992 teaser intro. A collage of not so rare footage. Another Stanley Dorfman video, both versions are the same, except for the 1992 teaser intro. Another video collage using every possible Lennon footage (including some from the "Let it Be" sessions), sometimes the very same footage that is present on many other videos. 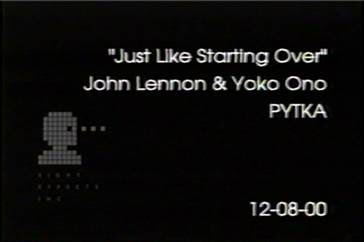 Version 1 has a slate showing a picture of Yoko and John with the title "Living On Borrowed Time", and during the final part the credits appear over John’s face: "Copyright 1984 Polygram Records, Inc". Version 2 has a blue screen, no picture, with a slate that reads "Borrowed Time" and there is no copyright credits during the end. Version 3 has the teaser intro from the 1992 Video Collection. Another new conceptual video created for "Lennon Legend", using pictures of John as a child creating a “motion sequence”, plus some other footage from various periods of his career and life, some very rare. The audio is also the full-length take, no fade-out. A not so well known official video. A conceptual story of a man meeting a woman in a restaurant. This video has never been on any of the official video collections to date. 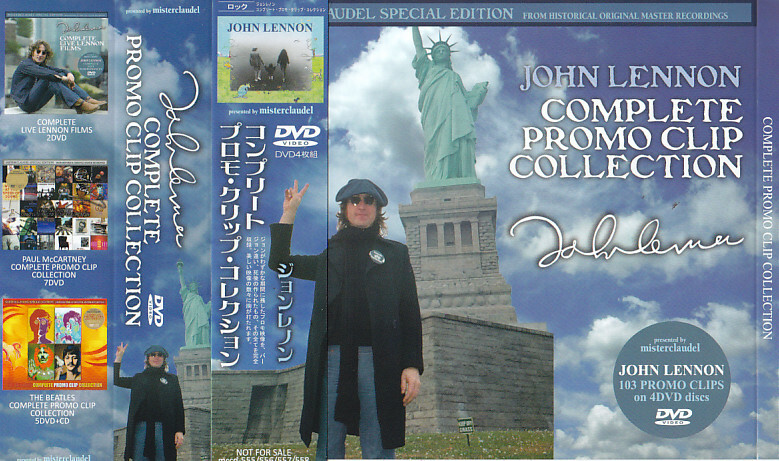 As part of the ‘Lennon Anthology’ box set, two promotional videos were created. "I’m Losing You" featuring the original members of Cheap Trick and a combination of original Lennon drawings in animation, directed by Dean Karr. 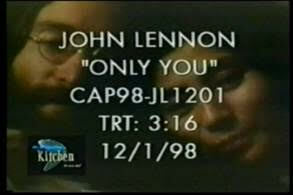 And "Only You", another collage of well known footage. 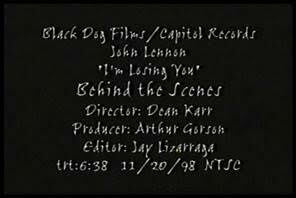 Plus, a "Behind the Scenes" video for "I’m Losing You" was also sent to the media as an individual video. Do not confuse this video ("I’m Losing You (Anthology Version))" with the unreleased footage from 1980, that recently was released by the bootleg label His Master’s Choice. That comes from an unfinished attempt to record a video for the released version on LP of the song "I’m Losing You" (which is not the Cheap Trick version), Lennon didn’t liked the way he looked and the video was never finished, also, it does not count as an official videoclip because all we have is outtake footage. The Japanese bootleg label Misterclaudel have put together all the videos in a 4 DVD Box set, using the best possible sources and quality, adding some goodies, like slates, outtakes and original TV commercials, plus the unreleased or hard to find versions of some videos. 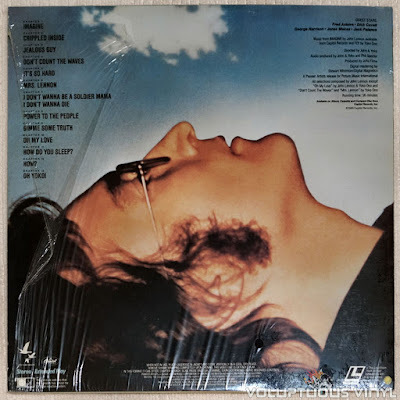 Mike Carrera supplied the text and many images for this article, we have inserted appropriate video examples from John Lennon's official YouTube channel and made a few corrections, as well as depicted some of the official releases where you can find the videos discussed here. Edited into the new version of the "Penny Lane" film. 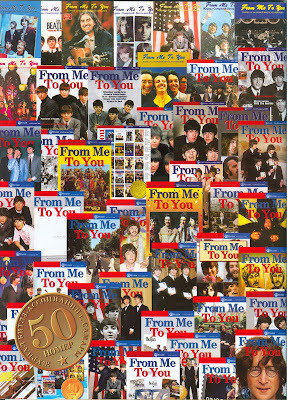 Apart from getting a whole lot of praise from not only FOCAL International, but also from the mainstream media, die-hard Beatles video collectors employed or educated in film restoration technology have criticised the finished product for it's omissions, for rushed colour jobs and for presenting some of the videos in formats that have caused jitter and other unwanted artefacts. Still, to the untrained eyes of regular viewers, the collection is great looking and sounding. Those samples were also labeled "1s Preview" and each video is 1 minute and 1 second in length. Revolution - One of the two different versions they made. Words of Love - 2013 radio version from "On Air - Live at the BBC Vol 2"
The recently taped interview with Paul McCartney on a special edition of BBC Radio 4's Mastertapes will be available today on the BBC iPlayer. 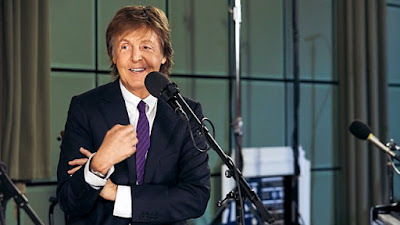 Paul McCartney talked to John Wilson about his career and answered questions from the audience at Maida Vale studios. A couple of our readers were present during the taping. During the interview session, Sir Paul said he had been at a loss when the band fell apart in acrimony in 1970. "It was difficult to know what to do after The Beatles. How do you follow that?" he told John Wilson. "I was depressed. You would be. You were breaking from your lifelong friends. So I took to the bevvies." The Beatles officially split in 1970 with the release of Let It Be, but the seeds of their demise were sown a year earlier, when the band appointed Allen Klein as their manager, against Sir Paul's wishes. Although Klein helped restructure the band's loss-making business, Apple, he also took a hefty share of their profits, and gave his own company the rights to press The Beatles' records in the US. He further angered Sir Paul by hiring Phil Spector to overdub a choir, orchestra and additional drums on to Let It Be; and attempted to make EMI delay the release of the star's first solo album. In order to divest himself of Klein's influence, Sir Paul had to sue his bandmates. The legal fall-out was the caustic agent that finally broke his bond with John Lennon. "The business thing split us apart," said Sir Paul, adding that all the "heavy meetings" were "doing my head in". He became so depressed that he did not know "whether I was still going to continue in music". Eventually, he moved to Scotland - partly to make himself unavailable for the business meetings - and hit the bottle. "I was far gone," he said. "It was Linda who said, 'you've got to get it together...' and that led to Wings." "I liked the idea of a band. I wanted to go back to square one." However, he admitted: "We were terrible. We weren't a good group. People said, 'Linda can't play keyboards,' and it was true. "But John couldn't play guitar when we started [The Beatles]." Mastertapes was recorded in Studio 3 of the BBC's historic Maida Vale, where the Beatles taped numerous radio sessions in the 1960s. Among the audience were Brad Pitt, Paul Weller, Noel Gallagher, Martin Freeman, James Bay and Simon Pegg, as well as 100 members of the public, many of whom were able to put questions to Sir Paul. Sir Paul talked about the writing of solo songs including Maybe I'm Amazed, Coming Up and Dance Tonight, as well as his Band on The Run and Sgt Pepper's. The conversation also covered his recent collaborations with Kanye West, revealing: "We never appeared to write a song. A lot of what we did was just telling each other stories." "People says he's eccentric... which you'd have to agree with. He's a monster. He's a crazy guy that comes up with great stuff." And Sir Paul discussed how his relationship with John Lennon had improved in the months before the star's untimely death in 1980. "I would make calls to John occasionally," he said. "We just talked kids and baking bread." Sir Paul McCartney's Mastertapes interview is available now on the BBC iPlayer and Red Button. It will be broadcast on BBC Radio 4 this Saturday, 28 May..
Video from the interview session. "Cover" for the online release of the remixed tracks. If you were unable to secure a physical copy of the remixed versions of Paul McCartney & Wings' "Nineteen Hundred And Eighty Five (Paul McCartney & Wings Vs. Timo Maas & James Teej)" in April, the three versions have now been released as downloads from Amazon.com. 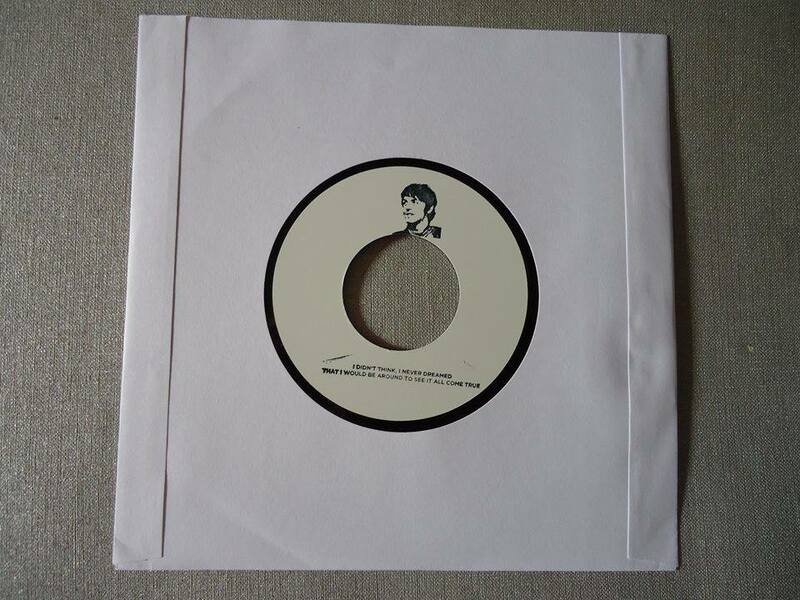 It's the A and B sides of the extremely limited edition vinyl single, plus a radio edit. The tracks are also on Spotify. The white label 12" vinyl promo. 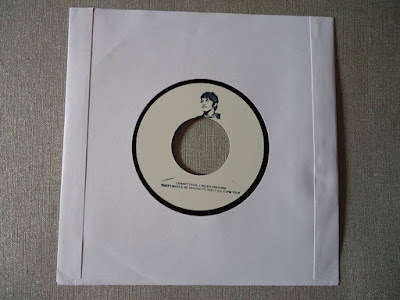 Just 100 copies of a one sided 7" single containing the radio edit were pressed at the Vinyl Factory and these were available only at Phonica Records in Soho, London. From Me To You, issue #50. 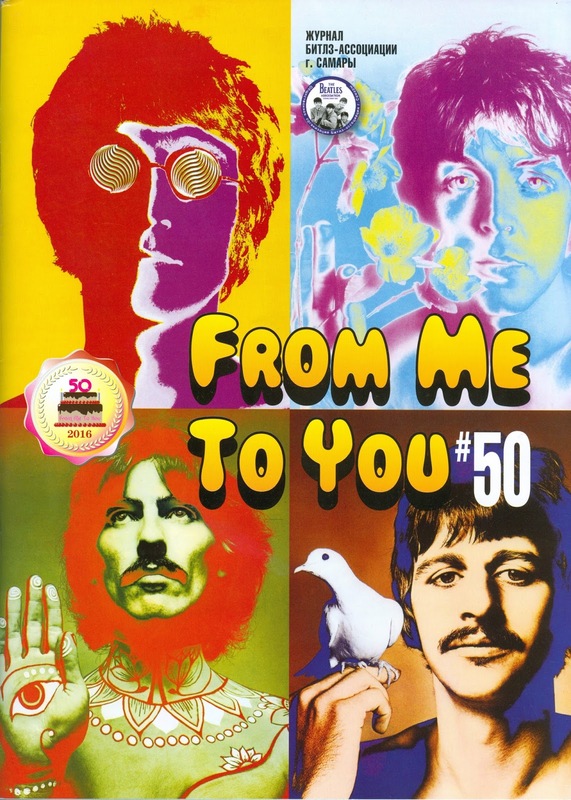 The Russian Beatles fanzine "From Me To You" celebrates its fiftieth issue. The fanzine has been published quarterly since 2005 - in Russian. The back cover of issue #50 depicts front pages of earlier #s.
You can leaf through a few sample pages of issue #33 as a pdf file here. Click this link for a mobile version of this site for a more convenient design, better suited for tablets and mobile phones. The links lead to my Amazon store where you will find books, CD's, DVD's etc discussed in the blog. Follow The Daily Beatle on Twitter. This website is all about The Beatles and the individual members of The Beatles. It is kept by Roger Stormo, who has been associated with the Norwegian Beatles fan club, "Norwegian Wood", since 1980. Feel free to quote from the site, but please give me credit and a link back to the original item. This is not a news site per se, but if we hear about something that has yet to be reported by other Beatles news services, we tend to write about it. Apart from that, we will write stuff about the Beatles on an irregular basis at the whim of the author. A lot of our readers arrive at specific articles from internet searches or references to this site from forums and other Beatles sites. If you did, we encourage you to click here to access the main page, and also to indulge in our archives - you may find other posts that are interesting. You may also subscribe to news from the site and have each new issue delivered to your rss feed reader. Lost Top of the pops footage found? Dont Bother me - live performance? Meet the Beatles --- For real! The Beatles Archives - Fotos e fatos da melhor banda de todos os tempos. The text is © Roger Stormo, unless otherwise noted. We have no responsibility for links. Awesome Inc. theme. Powered by Blogger.